On November 17, World Day of Remembrance for Road Traffic Victims was observed around the globe. Each year, more than 100 countries worldwide dedicate a day to mourn the millions of lives lost on the road and to acknowledge the tireless efforts of the police and ambulance personnel, doctors, nurses, and counselors who work to save lives after road traffic crashes. In the week leading up to World Day of Remembrance, we organized events in Vietnam and Cambodia to raise awareness about the tragedy of road traffic fatalities and injuries and share how they can be prevented through helmet use. This month we also launched a new project on GlobalGiving to raise funds for our traffic safety interventions to protect Cambodian youths on the road. Your donation to our project, Protect Cambodian Children from Brain Injury, will provide children with high-quality helmets, equip them with life-saving traffic safety knowledge and skills, and engage them in innovate road safety activities. Donate in the month of December and help us win a bonus award of $3,000 for our project from GlobalGiving! 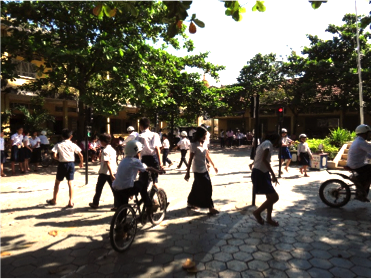 On October 30, 2013, students, teachers, and parents of Vinh Loc 1 Primary School came together with The United Parcel Service (UPS), the Asia Injury Prevention (AIP) Foundation, and local government officials to ride through Binh Chanh district, raising awareness of the importance of helmets that meet safety standards for children. The rally marked the launch of the third year of the Helmets for Kids initiative sponsored by The UPS Foundation with a donation of 3,966 helmets for students and teachers at six schools in Ho Chi Minh City. 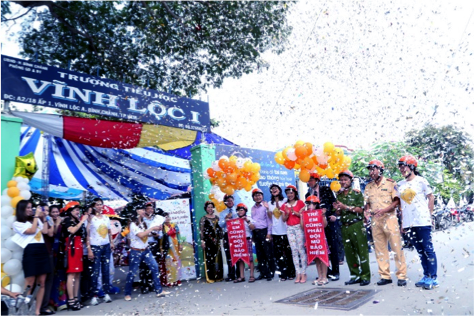 Nearly 1,500 children, parents, school officials, and local stakeholders, including Ho Chi Minh Traffic Safety Committee, Department of Education and Training, and Goodwill Ambassador Thanh Thuy, attended the kick-off ceremony at Vinh Loc 1 school, which was followed by a parade of motorcycles through the surrounding neighborhood. Rally participants carried flags bearing the message: "Children also need a helmet." This year's Helmets for Kids initiative will also include road safety trainings for teachers and students, outreach to parents, extracurricular activities, billboards, and the distribution of hand-fans and school timetables promoting child helmet use. Following the kick-off, 18 UPS volunteers conducted helmet kick-off ceremonies at 5 more primary schools, donating a total of 3,966 helmets to students and teachers. The project also coordinated two orientation workshops and teacher trainings for schools that are new to the project. These workshops gave 74 teachers the tools to educate children and parents about the importance of child helmet use and good road safety behaviors. These teachers will reach 3,745 students with this information. Two panel discussions with parents were also organized, reaching 2,164 parents. At these discussions the mothers of traffic victims shared their stories, and police shared information about the child helmet law, proper helmet use, and how to identify helmets that meets safety standards. Read the press release and view the photos. On November 1st, Johnson & Johnson, AIP Foundation and the Dong Nai Department of Education and Training conducted extra-curricular road safety activities and helmet use trainings for 750 students and teachers at Vo Thị Sau Primary School in Bien Hoa, Dong Nai province. Activities included picture puzzles and puppet shows to generate enthusiasm about helmet use and reinforce the importance of safe road behaviors. 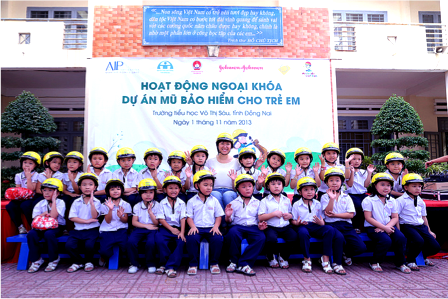 These extra-curricular activities for primary school students are being conducted as part of Johnson & Johnson's sponsorship of Helmets for Kids at 32 schools in three provinces: Ha TInh, Quang Binh and Dong Nai. Last month, Johnson & Johnson donated 3,848 helmets to all first graders and other students at the 32 project schools whose previously received helmets were damaged. Together, Johnson & Johnson and AIP Foundation have donated 21,476 helmets in two years of Helmets for Kids partnership. 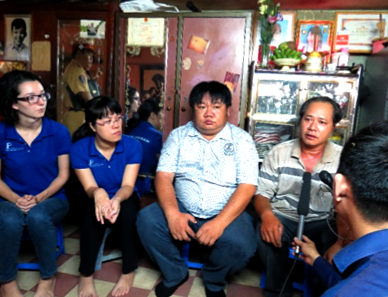 On November 15th, AIP Foundation, the Ho Chi Minh City Traffic Safety Committee, Department of Education and Training, Traffic Police, and Duc Huy company visited the families of 10 road traffic crash victims to increase awareness about road safety and to observe World Day of Remembrance for Road Traffic Crash Victims. Local and national media representatives accompanied these visits and asked the families to share their stories. Those visited included parents of children who were killed in road traffic crashes, and those who sustained brain damage as the result of serious head injury from crashes without helmets. Many of these individuals who sustained brain damage had previously been primary breadwinners for their families, their injuries have pushed their families into poverty and turned elderly parents into caregivers and primary breadwinners. On Friday November 22nd, representatives from AIP Foundation and the Ho Chi Minh City Traffic Safety Committee and Department of Education and Training recorded a talk show for Ho Chi Minh City Television (HTV). The talk show, "In Retrospective – World Day of Remembrance for Road Crash Victims," highlighted the activities organized to spread awareness about road safety by government, educators, and NGOs. The guests also discussed future plans for collaborating to improve road safety throughout Ho Chi Minh City. The talk show aired on December 2nd, 2013. 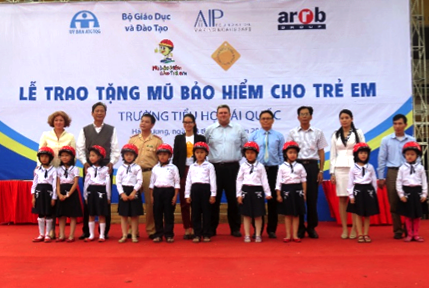 On November 18, ARRB Group, one of Australia's most trusted advisors regarding road safety technical input, returned to Ai Quoc Primary School in Hai Duong for a Helmets for Kids helmet top-off ceremony. During this top-off, ARRB donated 190 helmets to first graders, new teachers, and students in second through fifth grade who have outgrown, lost, or damaged the helmets that they previously received from the company's helmet handover last March. The ceremony was attended by road safety expert Paul Hillier, a National Technical Leader at ARRB, as a stop on his trip to Sichuan province in China to assess pedestrian safety around schools. Activities of the top-off ceremony included traffic safety and child helmet use training for students and teachers, student performances, and remarks by community, school, and sponsor representatives. A photo exhibition with a road safety theme was also organized along with a helmet training game teaching students about how to properly wear their new helmets. 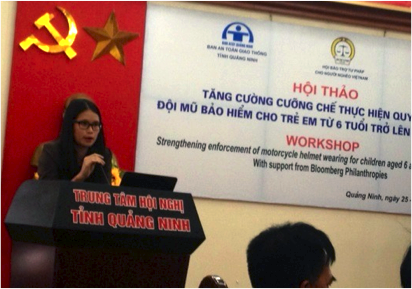 On November 25th, AIP Foundation Deputy Executive Director Hoang Na Huong attended a road safety workshop about strengthening the enforcement of child helmet use in Quang Ninh. Na Huong presented about AIP Foundation's successful child helmet campaign in Vietnam and shared lessons learned, along with recommendations for innovative programs. The workshop was organized by the Vietnam Justice Support Association for the Poor, the Quang Ninh Traffic Safety Committee, and the Global Road Safety Partnership. Participants from the five Northern provinces under the Road Safety in 10 Countries (RS10) project (Nam Dinh, Vinh Phuc, Bac Ninh, Thai Binh and Quang Ninh) requested additional materials for their use to increase awareness about the importance of child helmet use. 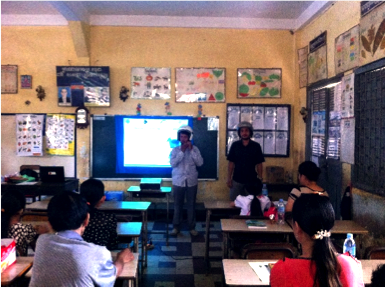 The workshop included an observation trip for participants to visit enforcement activities at two primary schools in Quang Ninh. On November 29th and 30th the Saigon Players, an English language theater group in Ho Chi Minh City, performed "The Lifecycle of Saigon," a sketch comedy production about motorcycles. The productions celebrated the troupe's 10th anniversary with skits and songs about the ubiquity of motorcycles (and helmets) in Saigon's culture. The Saigon Players donated a portion of the show's proceeds to fund AIP Foundation's work in Vietnam. On November 17, 2013, the 20th annual World Day of Remembrance for Road Traffic Victims was observed around the world. Each year, more than 100 countries around the globe dedicate a day to mourn the millions of lives lost on the road and to acknowledge the efforts of the police and ambulance personnel, doctors, nurses, and counselors who work to save lives after road traffic crashes. In the week leading up to the World Day of Remembrance, the Asia Injury Prevention (AIP) Foundation Cambodia organized events in schools around Phnom Penh to raise awareness about the tragedy of road traffic fatalities and injuries and spread information about how they can be prevented through helmet use. On November 13th and 14th, Helmets for Families sponsored by Manulife Cambodia organized road safety activities at two project schools in Phnom Penh. On November 13th, a parent training workshop on helmet use was conducted at Wat Preah Put Primary School, teaching 50 parents about the importance of helmet use for themselves and their children. The training was held as follow-up to Manulife's donation of 647 helmets to students, teachers, and mothers as part of the Helmets for Families program last month. On November 14th, extra-curricular road safety activities were organized for 100 students at Sampov Meas Primary School. These activities included drawing contests, pedestrian and bicyclist safety lessons, and helmet wearing speed tests. Activities and trainings are conducted after helmet donations to reinforce the importance of helmet use and good road safety behaviors and to ensure that students and parents continue to wear their helmets properly. 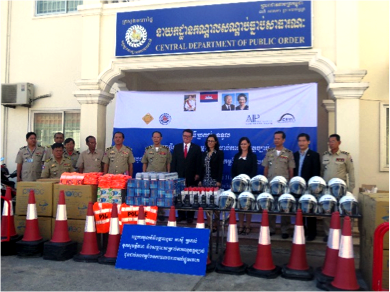 On November 21st, the Asia Injury Prevention (AIP) Foundation donated road safety equipment to representatives of the National Police of Cambodia as part of the Cambodia Helmet Vaccine Initiative (CHVI). The donation was made to support the increased enforcement of the national helmet law as part of the government of Cambodia's commitment to meeting the goals of the UN Decade of Action for Road Safety. AIP Foundation's donation to police included a total of 1,000 helmets along with vital road safety equipment such as traffic cones and fences, radios, strobe lights, rechargeable lamps, and reflective vests. Next year, representatives of the Cambodian Police will embark on a study tour of Vietnam and Malaysia where they will gain the knowledge and skills necessary to enforce the motorcycle passenger, including child, helmet law, which is awaiting government approval. Along with this donation, AIP Foundation President and Founder Greig Craft and Chief Executive Officer Mirjam Sidik visited Phnom Penh to meet with H.E Lt. General Chan Kim Seng, Director of the Central Department of Public Order, General Commissariat of the National Police and H.E Hun Many, Parliamentarian and President of the Union of Youth Federation to discuss the recommendations of the joint statement "Motorcycle passengers, including children, must wear helmets." More than 100 stakeholders from the private sector, civil society, and international community have endorsed the joint statement urging the government to pass comprehensive helmet legislation. Earlier this month, CHVI's work on the joint statement was highlighted in the UN Secretary General's report Improving road safety as an example of how non-profit organizations and governments around the world are working together to increase road safety.